Rabbi Freundlich joined Congregation TBDJ in August 2016, after moving to Montreal from Atlanta, Georgia. He previously served as Associate Rabbi at Atlanta’s Congregation Beth Jacob from 2007 to 2016. From 2014-16 he also served as Head of School at Yeshiva Ohr Yisrael, a 40-student high school for boys, where he also taught for several years. 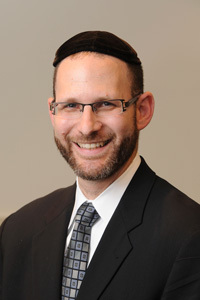 “Rabbi Y”, as he is known to many of his congregants and students, received his Semicha in 2005 from Baltimore’s Ner Israel Rabbinical College, where he also earned a Masters of Talmudic Law. He holds a Bachelor of Arts in Psychology from the University of Maryland, and a Master of Science Degree in Professional Counseling from Georgia State University. Rabbi Freundlich served as a member of the Atlanta Scholars Kollel, responsible for promoting personal and religious growth through family meetings, personal development classes and social programming, with special attention given to marital counseling and parenting consultations. In this role he also directed the Maor Eliyahu program, an advanced nightly Talmud study group, and held outreach responsibilities for university students and pre-school parents. Amongst his other accomplishments and publications, Rabbi Freundlich developed a popular “3 Minute Parenting Through the Parsha” video series which was featured by Aish.com and OU.org. The video series can be viewed here: http://tbdj.org/RYF1. Together with his wife Rifki, The Freundlichs are parents to seven children: Racheli, Binyamin, Ephraim, Shlomo, Rena, Shai, and Shayna.